Chancellor Rogerson addressed the results of a study by UA Little Rock’s Institutional Effectiveness Committee intended to lay out methods for improving the university’s overall success at an open forum in early February. “This really is about getting the educational component–the vision of this university–correct in the years going forward,” chancellor Andrew Rogerson said at an open forum in early February. Some of the study’s recommendations included looking deeper into last semester’s housing study for ways to improve the campus living experience, increasing staffing for the concurrent enrollment program, investing in a centralized career services center, reassessing the allocation of Signature Experience Grants, and looking for ways to even out the disproportionate level of student services in the College of Engineering and Information Technology relative to other disciplines. Though the information in this report fills up 75 pages, the chancellor does not believe that it is a be-all-end-all plan of action for the university. The report has received criticism from within the university. Jovanovic pointed to errors in data collection, which he claims led to misjudgments about the needs of individual programs in his department. Nonetheless, Rogerson emphasizes the need to listen to the report and the IEC, the latter of whom will be consulted during each step of the improvement process. While the university is facing depreciation, much like the universities at Fort Smith, Pine Bluff and Monticello, the chancellor believes that there are some silver linings and urged those attending the forum not to overreact. The main thrust of the chancellor’s plan is to convince the board of trustees that, instead of making more cuts, the university needs to grow out of its deficit. Though he admits that some further cuts may be necessary, he wants to avoid any more big ones. One such strategy for growing out of the deficit would be a 2% salary raise, an idea Rogerson had already given to former dean of students Preston Slayden to take to the board of trustees. However, he makes no guarantee that it will get the green light. The chancellor also reported that we can expect suggestions for an enrollment plan from Charles Donaldson, former vice chancellor of student services. 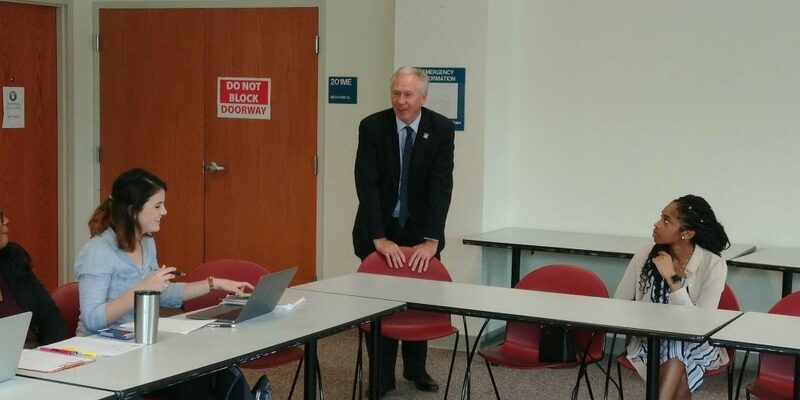 During Donaldson’s tenure, the university had a strategic enrollment student office where three bodies coordinated to manage the processes taking place below, and the chancellor expects that the plan will resemble this arrangement. Of course, in addition to bringing in new students, the chancellor believes that retaining the current ones is key. Daryl Rice, associate vice chancellor of academic affairs, has created a university-wide retention committee and is compiling an inventory of all services, activities, and initiatives aimed at retention. It remains to be seen whether or not the Fall 2019 numbers will reflect administration’s efforts. What is certain is that the chancellor will have to answer for both his successes and failures on Feb. 25 at 5 p.m., when another open forum will begin in the Ledbetter rooms.